While it’s more than easy to know when you need to go on a nice vacation (the answer is “always,” right? ), figuring out where you want to go is a bit harder, if not the hardest part. Do you want to picnic in the shadow of the Eiffel Tower? Or snorkel along the Great Barrier Reef? How is a normal person supposed to decide? Luckily, it just got a little easier, thanks to a new ranking of the world’s top travel destinations this year from TripAdvisor. Despite the Brexit drama, London knocked Paris out of the top spot in this year’s rankings, thanks to a plethora of positive reviews and ratings on hotels, restaurants, and experiences in the last year, according to the report. TripAdvisor suggests the royal wedding spotlight was a major player in many people’s decisions to visit London this year, and propel it to No. 1 on the list. The site saw an increase in ratings on royal-related experiences, too. 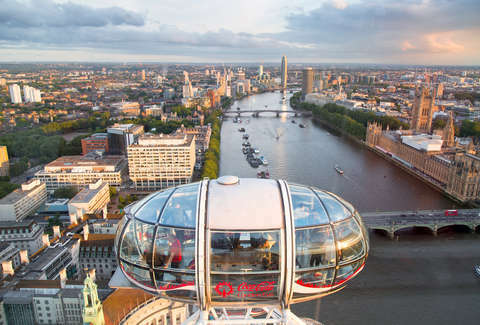 Laura Citron, CEO of Visit London, told TripAdvisor the agency was “delighted” to claim the top spot this year. Paris moved down to the second spot on the list, followed by Rome. Meanwhile, New York, which has held a spot in the top destinations for some time, was bumped out of the top 10 for the first time in 2019. Other, more exotic places, took its place, which suggests that travelers are broadening their horizons when it comes to getting out and experiencing the world. Many of these locations should come as no surprise to seasoned travelers or people who spend a lot of time scouring the web for discounted flights. In 2019, a number of discounted flights to these cities -- including Paris and Bali -- have been offered by airlines, which likely helped push people to go. Of course, the new ranking probably won’t provide an instant solution for your next big trip, but hey, maybe it’s enough to give you some ideas, or maybe even confirm where you know you don’t want to go. It probably wouldn’t hurt to check out 2019’s happiest countries in the world, too.